Help us Float or Boat, purchase a P.S.Curlip replacement hull plank with your own family or business time capsule, engraved plaque on the plank. All planks are sold, ‘Float our Boat’ is fully subscribed. THANK YOU. Help us to 'Float our Boat" Fully subscribed. Purchase your own Maritime Time Capsule. 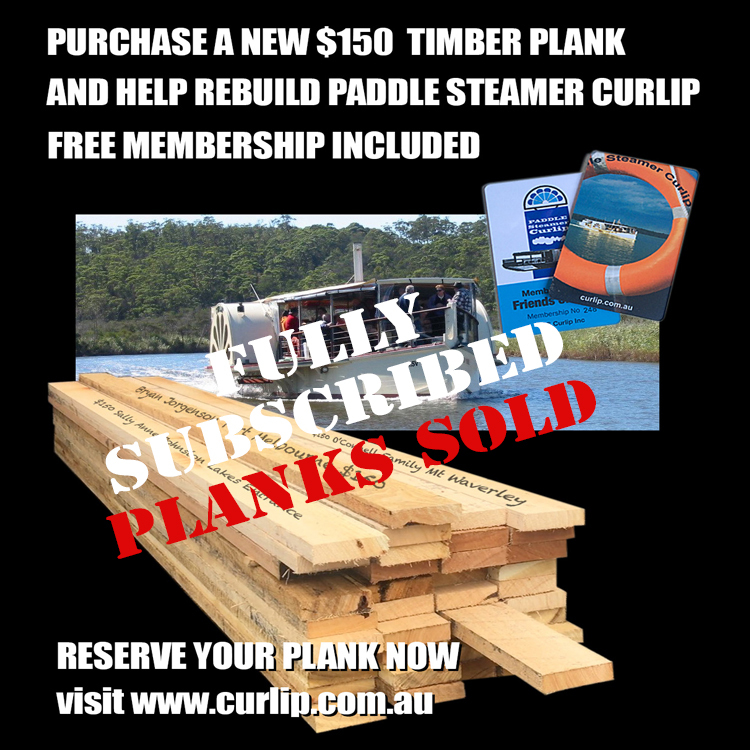 A new plank for Paddle Steamer Curlip's Hull, for $150 and receive a Free P.S.Curlip Inc. Membership. Robert Young, manager of our Boat Building committee, inspecting the first trial cuts of our selected, Yellow Stringy Bark Planks at the MecTec Timber Mill, near Orbost Victoria. P.S.CURLIP PLANKS FOR SALE FROM 1 MARCH 2018. Secure your own piece of Australian and Gippsland Lakes Boating History. Once fitted your plank will carry your name plaque inside Paddle Steamer Curlip's hull commemorating your contribution. Please consider this offer to help rebuild Paddle Steamer Curlip's hull, devastated by Marine Teredo Worms. Your contribution will stand for the next 100 years as a plaque attached to the inside of the hull, on your own plank. Each first grade Yellow Stringy Bark Plank is between 5.5 metres and 7.2 metres long. 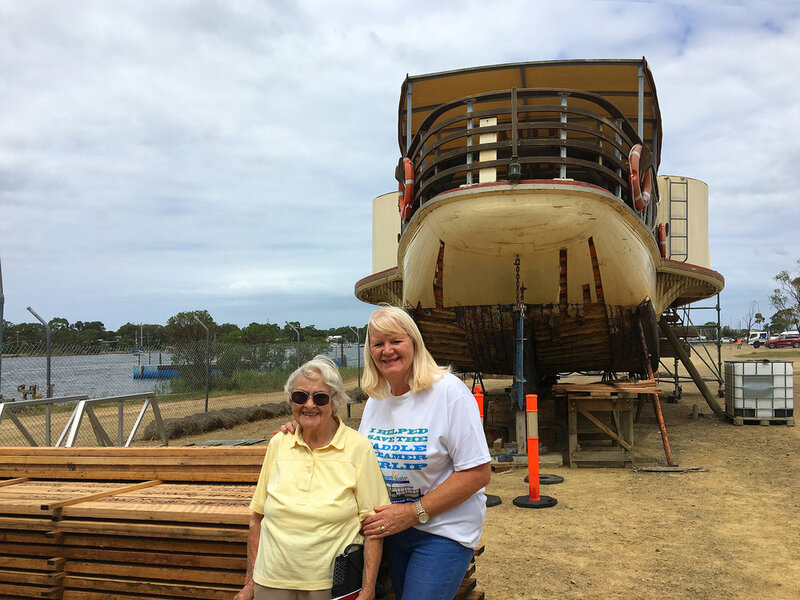 We have 150 planks (more than 4 tonnes) to fit to Paddle Steamer Curlip's hull, before we can return her to service on the water as an asset of the East Gippsland Community, where she will raise funds for those in need. STOP PRESS With your amazing support and generosity all 150 planks on offer, are now sold. The fixing screws more than 6000 have been purchased a the planks will start to be applied to the hull. We have achieved what many said was impossible. Thank you to our supporters in the greater Gippsland and Victorian Community. You will also receive 1 free Friends of Curlip Membership, normally valued at $85.00. This membership entitles you to a Launch Cruise on Paddle Steamer Curlip, when she returns to the water, valued at $45.00. Your personally numbered membership card, will be proof of your purchase. VISIT OUR ONLINE STORE TO PURCHASE YOUR PLANK AND COMPLIMENTARY MEMBERSHIP TODAY. We are asking our supporters to PAY THEIR DONATION FORWARD to enable us to repair Paddle Steamer Curlip's hull. Your donation or purchase will help us pay back the money we have borrowed to purchase the shipment of Timber. We needed to do this as the sourcing of ecologically sustainable first grade Australian Hardwood from private holdings, in lengths suitable for boat building is a very finite and limited resource that needed to be ordered nearly 6 months ago. Our community is rallying to our cause, the stories that are unfolding are truly heart warming. "Millie Mc Grath a 90 year old visited our open day in February 2018, she asked if she could purchase a plank, but only had $85.00. We had a cuppa with Millie and said we would be happy to have her come onboard as a "Friend of Curlip" It was so good to have a visit from a community member we hadn't met before. Next morning Millie arrived and insisted we accept the balance, she also purchased another 4 planks, one for each of her very grown up family.